Mark III High Speed lenses were available in both S16mm and S35mm versions. Their appearance is very similar. Note the “Arriflex Super 16” mark on the 50mm lens (top image). 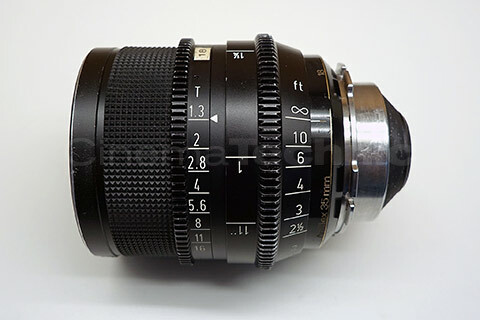 9.5, 12 and 16mm focal lengths are available for Super 16 format only. 25 and 50mm focal lengths are available in both Super 16 and 35mm versions. 35mm format lenses will be marked “Arriflex 35mm” in the same position (look carefully at the bottom photo). 18, 35, 65 and 85mm focal lengths are available for 35mm format only. The Mk. III version all have a gear on the iris ring and larger more legible focus marks with vertically oriented numbers. The mechanics of the S35mm format versions 2.1 and 3 are neraly identical. The S16mm format lenses have a different focus helix thread that allows rotation of nearly a full turn. Mk. III focus scales are slightly larger in diameter than Mk II and are marked in feet or meter exclusively. 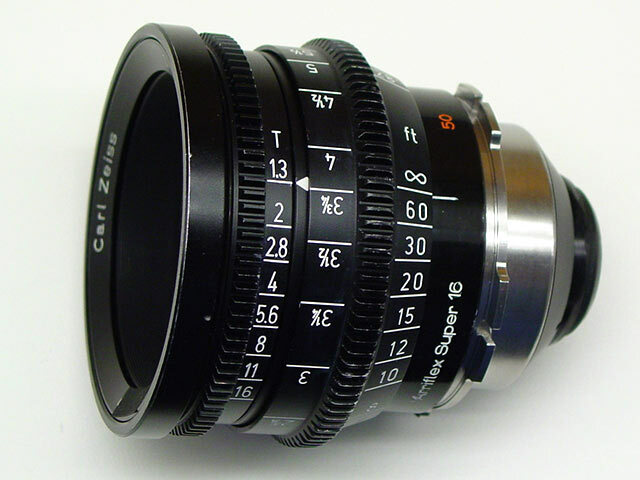 The focus gear is 80.8mm diameter for S16mm lenses. The focus marks are larger and have witness lines engraved underneath to show exactly where each distance is calibrated. The distance marks are oriented at 90º to the optical axis of the lens instead of on the axis as with the Mark II. There is one scale for each side of the lens, so the assistant does not have to “flip” the lens over to have a focus scale available when switching sides on the camera. Although there is more room on the Mk III scale ring due to the longer rotation, the larger size of the marks means that there are less marks near infinity. Also Mark III focus scales are feet only or meter only (not dual-standard). Changing distance standards requires replacing the entire focus ring, which needs to be matched with the letter code engraved near the “feet” or “meter” engraving. Replacement rings are no longer available from the manufacturer. Optics and irises are the same for the Mark II and Mark III versions, both for S16mm and S35mm format lenses. ©2016 Jorge Diaz-Amador. All text, images and other content on this site are original copyrighted works. CinemaTechnic and Jorge Diaz-Amador own exclusive rights to this content under the United States Copyright Act of 1976. Unauthorized use and/or duplication of this material without express and written permission from this website’s author and owner is strictly prohibited.